Mon, Jul 9, 2018, 07:18 pm SL Time, ColomboPage News Desk, Sri Lanka. 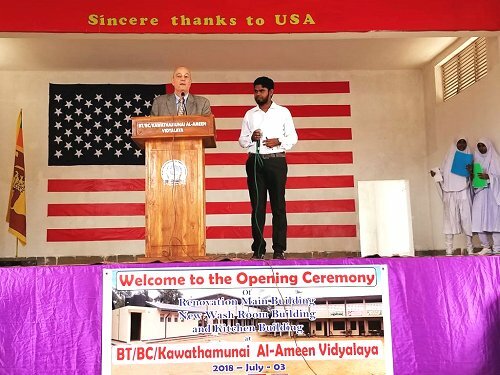 July 09, Colombo: As part of the United States government's support for a reconciled and unified Sri Lanka, the U.S. Pacific Command (PACOM) renovated two schools in the Eastern Province, the U.S. Embassy in Colombo said in a release. James L. Russo, the U.S. Embassy's Counselor for Press, Academic, and Cultural Affairs, presided over the official ribbon cutting ceremonies on July 2 and 3, 2018. Also participating were Deputy Minister of National Integration, Reconciliation, and Official Languages Ali Zahir Moulana; Coordinating Secretary for Deputy Health Minister Zarrjun Aboobucker; Zonal Director of Education M.L. Ahamed Junaid; and Captain Robert Holbrook of PACOM. PACOM funded the renovation of the Kavathamunai al-Ameen school, which cost $308,292 (LKR 47,710,136). 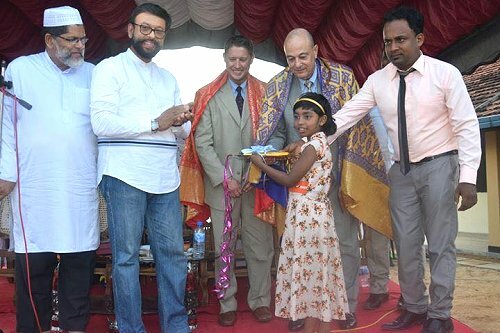 This gift from the people of the United States of America to the people of Sri Lanka includes the renovation of a classroom building and the construction of an emergency kitchen, a 10,000 liter rainwater harvesting system, and a handicap-accessible bathroom. PACOM also contributed $272,174 (LKR 43,003,492) for the renovation of the Abdul Cader School. 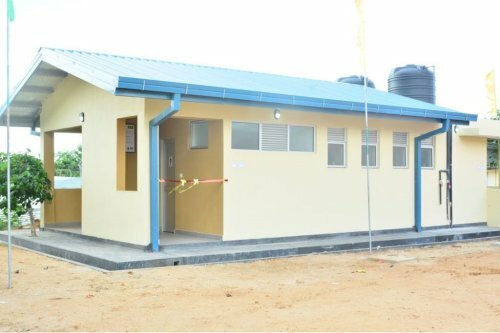 This project renovated a classroom building and constructed an emergency kitchen, a 10,000 liter rainwater harvesting system, and a handicap-accessible bathroom. Both renovation projects will improve the learning environment of the students while providing the community with a designated safe haven during times of emergency. PACOM selected these schools based on recommendations from the Sri Lankan Eastern Province Ministry of Education and the Disaster Management Center. "It is an honor to be here in Batticaloa. This year, we are celebrating 70 years of U.S.-Sri Lankan partnership and recall that on February 4, 1948 then-U.S. President Harry Truman was one of the first foreign leaders to recognize Sri Lankan independence. Since then, U.S. cooperation has amounted to more than $2 billion (LKR 314 billion) in developmental assistance. We are privileged to participate today with the Ministry of Education in the renovation of these important centers of learning. As all the hardworking teachers in this room well know, education is the key that opens the golden door of opportunity," said Mr. Russo.